EDIT – 14/1/2016: This post will forever be rendered horribly ironic, for just over a week after its publication, David Bowie was dead. I thought a lot about what I’d do with it – whether I’d delete it, change the tense – but I’ve decided I’ll leave it as is, to show how much I loved his work before this tragedy. Rest in the greatest of peaces, Starman – I have always admired and loved your art like little else, and I always will, too. Between last August and October, I visited the ‘David Bowie Is…’ exhibition (recently in Melbourne) twice. 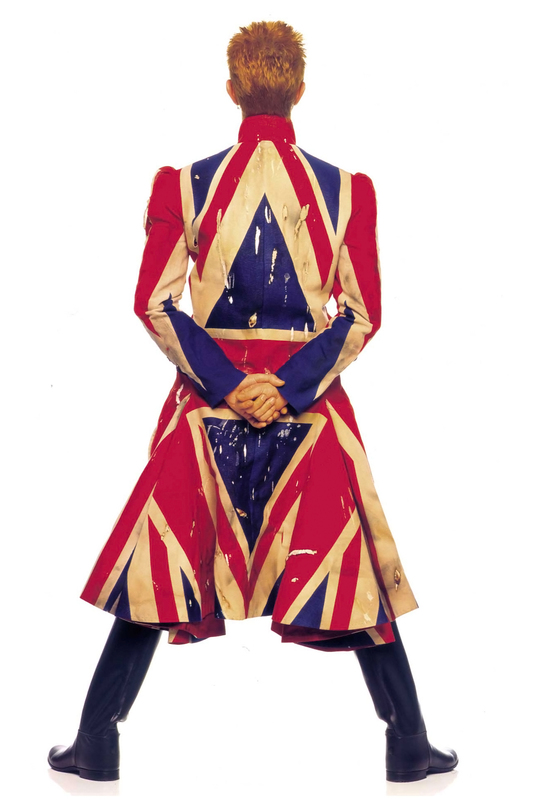 Curated with unlimited access to Bowie’s archives, the exhibition was truly amazing. 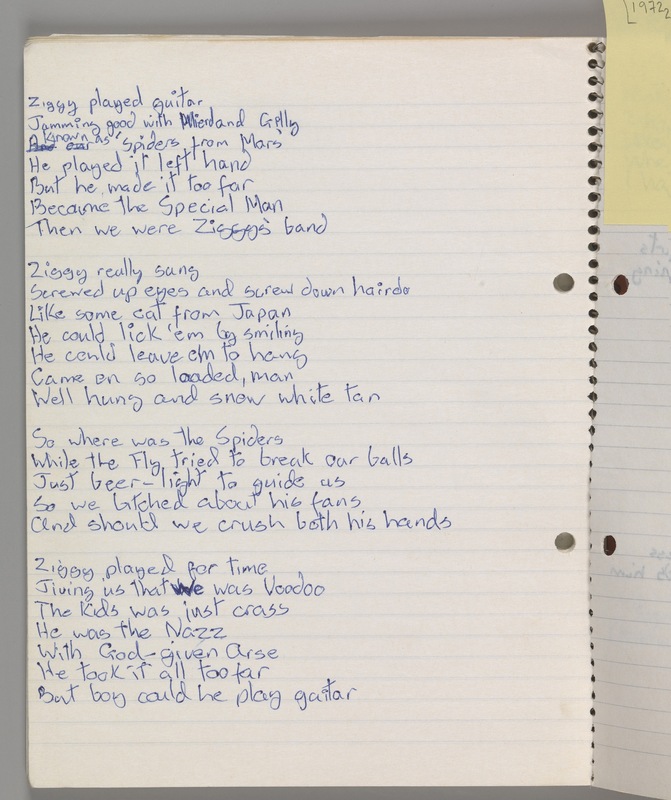 Featuring everything from handwritten lyric drafts, to a huge number of his famous costumes, to the guitar he recorded ‘Space Oddity’ on, the exhibition renewed my love for a near-original protagonist in my fixation with rock music. Bowie first entered my consciousness nearly three years ago. At the beginning of 2013, a friend introduced me to The Beatles, a discovery that changed almost every aspect of my life. However, as my love of their music grew into an deep passion that is still strong, she began to get tired and moved onto other artists who she also introduced me to. One of these was David Bowie. In the September of 2013, we briefly formed a duo together, and she had started to learn ‘Space Oddity’ on ukulele. She taught me the lyrics, and told me of him. But at the time, I felt that by listening to other artists, I would be betraying my love of The Beatles. He soon faded from my interest. Bowie reappeared in my life at the end of 2013. One night, a recent documentary named David Bowie: Five Years in the Making of an Icon was screened on TV, and my parents encouraged me to watch it with them. It was through this that I learnt of the worlds of Ziggy Stardust, Major Tom and the Thin White Duke; of Hunky Dory and “Heroes”. I was especially pleased to hear about John Lennon’s songwriting credit on ‘Fame’, though it would be a year before I listened to the song. 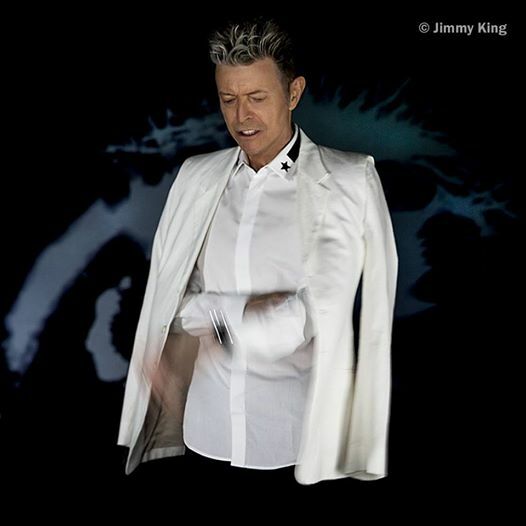 It wouldn’t be until I began using iTunes Radio in September 2014, however, that I truly became a Bowie fan. Songs such as ‘Suffragette City’, ‘Life on Mars’, ‘The Jean Genie’ and ‘Ashes to Ashes’ would frequently play, and I soon grew to love them. It’s been that way ever since. 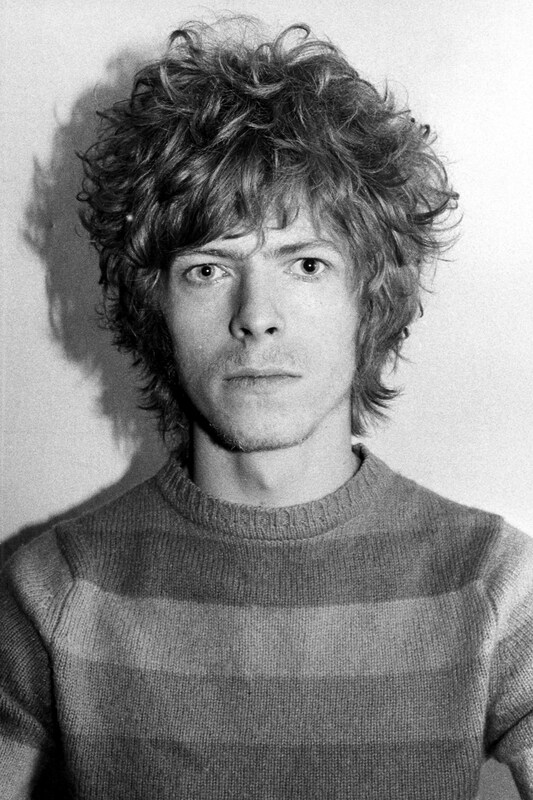 There is something fascinating about Bowie. Something that allows his work to remain almost as radical and dangerously thrilling as when it was first released. Something that allows him to be an omnipresent component of pop culture, yet remain an icon of the underground. Something that allows him to be among the few “classic rock” artists that makes even the current-day listener feel rebellious and ‘different’, in a time where rock’n’roll has been largely accepted by the establishment. Something which makes his mastery of ‘sound and vision’ among the greatest rock legends of all time. This “something” – his genius – is what I aim to explore today. Unlike many musicians, Bowie’s work is not solely musical. Among the great things about it is that he understood the importance of visual mediums, too – like film, fashion and photography. It is this that makes consuming his work a fascinating, multi-faceted experience, and is part of what establishes him as a true artist. Asides from the music, Bowie’s image was integral in making me a fan of his work. 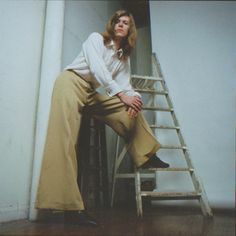 Even more than 40 years after the “death” of Ziggy Stardust, there is still little that looks as transfixing or as outlandishly unique as Bowie did in the early ’70s. 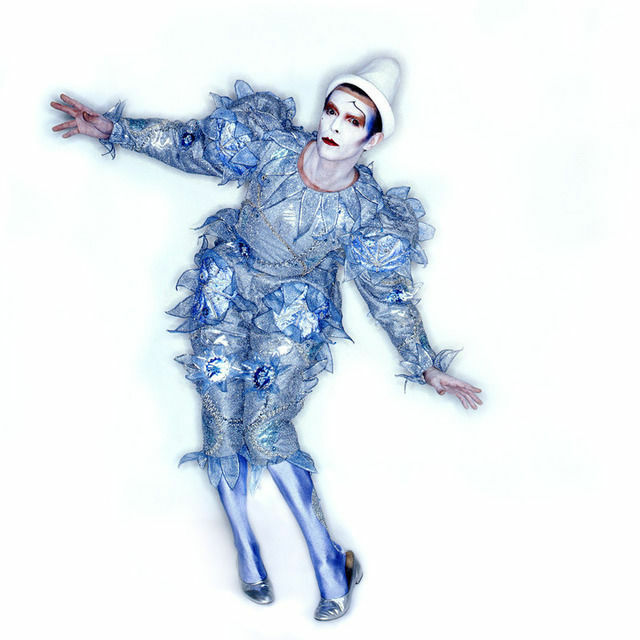 Dressing in flamboyant bodysuits and shining platform shoes, cutting his newly-bright-red hair into the famous “Ziggy” cut and applying eye-catching make-up (normally synonymous with femininity), the brand of fearlessly-decadent androgyny that Bowie created with the costumes from the Ziggy & Aladdin Sane periods is so unconventional that it cannot be defined by “male” or “female”, or even by the regular expectations of humans in general. There isn’t much in pop culture today that is as unafraid to push gender (and general) expectations – or looks as plain weird – as Bowie during that time, ensuring that his then-image remains almost as shocking and revolutionary now. 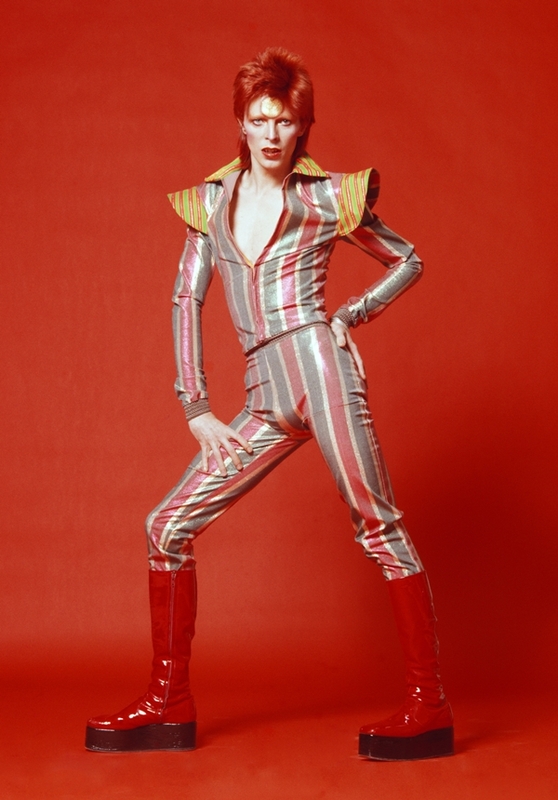 Of course, Bowie’s glam costumes are far from his only iconic fashion statement. 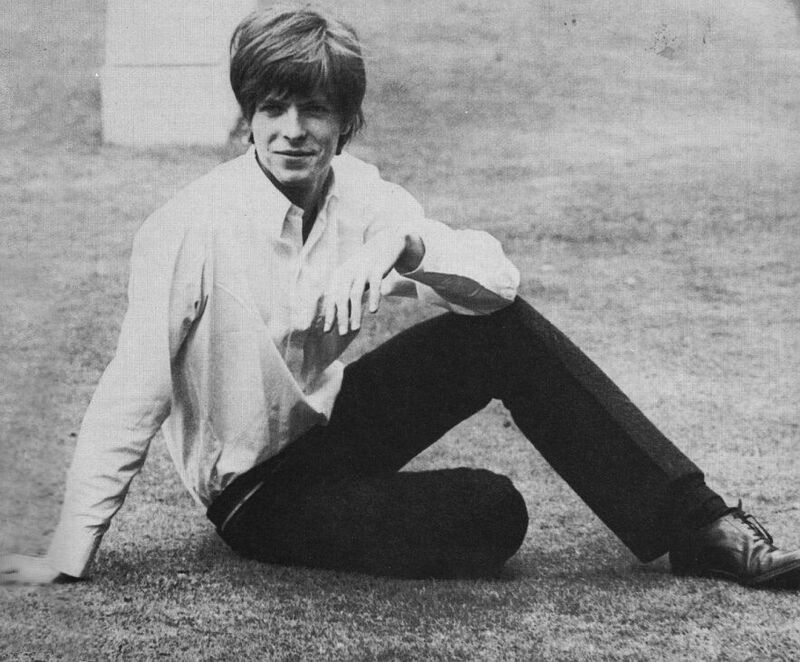 Almost each era of his career can be associated with various outfits – his mod fashions of the mid-’60s; his hippy-inspired look – accompanied with permed hair – of Space Oddity; the long hair and dresses (and, later, frilly shirts and high-waisted trousers) of The Man Who Sold The World and Hunky Dory; the stylish, minimalist suits of the Thin White Duke and The Man Who Fell To Earth‘s Thomas Jerome Newton; the leather jackets and coiffured hair of the Berlin Triptych; the silvery Pierrot costume of Scary Monsters…and Super Creeps; the distressed frock coats of Earthling. 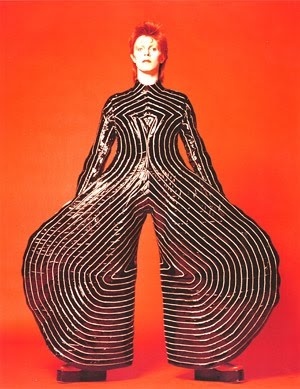 Working closely with talented designers (Kansai Yamamoto, Alexander McQueen), Bowie merged sound with vision (pun intended! ), using fashion and makeup to complement and enhance whatever themes, personas and styles he had been toying with at the time. It is his relationship with style that adds a new level to his work, helping give it its glamorous and idiosyncratic edge. Another visual medium that Bowie has also made great use of is film; this is appropriate, as he has really always been an actor. He studied mime in the earliest days of his career, and of course, his music (though often autobiographical, as well) is played from the perspective of whichever of his myriad of personas he is portraying at the time. 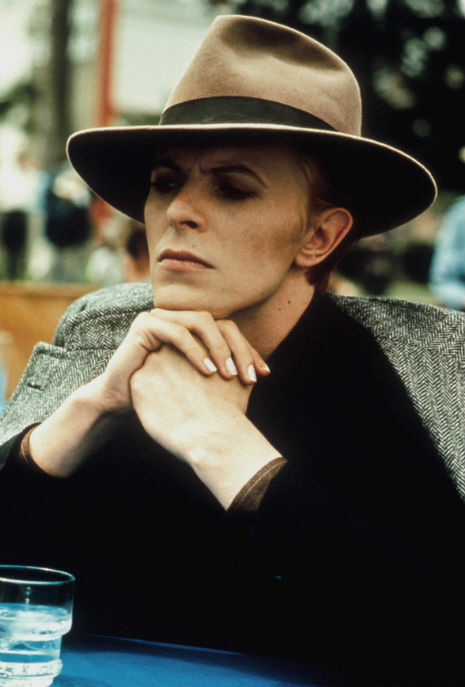 So it is unsurprising that Bowie lends himself well to silver-screen acting, too. 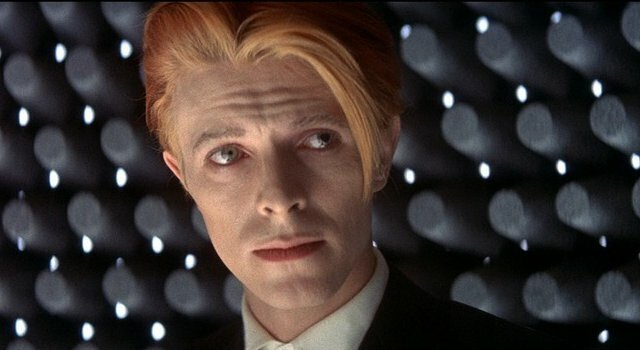 I’ve only seen a few Bowie films, so I’ll focus on my current favourite: The Man Who Fell To Earth. Following the story of Thomas Jerome Newton (an alien who has come to Earth, attempting to collect water for his dying planet), the film follows his painful downfall; over the film, Newton becomes increasingly corrupted by human vices and is jailed by the government whom he wrongly trusted, ending with him – spoiler alert – eternally stuck in the world he has been forced to accustom to, depressed and an alcoholic. Bowie’s feature-film debut, the film is bleak and heartbreakingly sad throughout, and almost confusingly ambiguous in parts, leading to its divisive status. However, I happen to love it. It should also be mentioned that the film owes much of its beauty to its visuals, too – I would write about this, but I feel these stills do a much better job than words. TMTWFTE is thematically as relevant today as it was in ’76. The wall of TV screens that Newton becomes addicted to foretell the arrival of the Internet & smart-devices, and the societal reactions that followed; perhaps Newton is really a human, whose differences have ostracised him from society, making the film powerful commentary on the way we treat what we don’t understand; it provokes questions about what we’d do if we ever discover alien life. It is a beautiful film, and I highly recommend seeing it if you haven’t already. 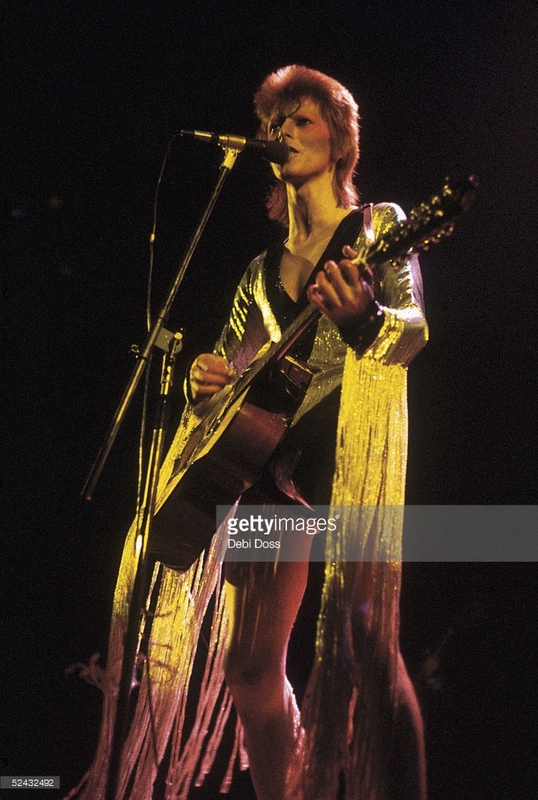 However, Bowie’s acting talents are just as evident within his music clips and concert footage. He acts whatever part – a persona, himself? – he may be playing at the time with charisma, beauty and the same feeling of “otherness” that recurs throughout his work, making the visuals almost as affecting as the music they support. It is with these clips that his merging of sound and vision is at its peak. It is no secret that David Bowie’s music is special. But as I listened to his albums while writing this post, I thought a lot about just how special it is. While his visuals are incredible and groundbreaking in their own right, his music is probably his greatest art. There is little in this world that is as magical and exciting as his best records. Where others see their targets. Or herald loud the death of Man? It’s a twenty-four hour service, guaranteed to make you tell. As though nothing could fall. But never leave the stream of warm impermanence. But still the days seem the same. I had to break up the band. Bowie’s lyrics are a huge part of what makes his songs great. Often, they are pure poetry. He writes with a rarely-found intelligence and eloquence; of fascinatingly thought-provoking subjects. His words are abstract, yet full of meaning; intellectual and metaphorical, yet concise; bleakly realist, yet weirdly uplifting; and for a man notoriously ‘non-political’ in public, the social and governmental commentary he writes is bitingly accurate. His lyrics are surprisingly relatable, too; while rockstars from Mars don’t exactly exist in real life, the themes – love, rebellion, our changing society, general commentary on humanity – that he alludes to are ones that most listeners will easily identify with. There are few artists that write as well as he does, and it’s a pity that he doesn’t receive the accolades he deserves. I could discuss the technical merits of the music that Bowie and his bands created. But why? Intervals and chord progressions aren’t usually the reason that a fan falls in love with an artist’s music. Take ‘”Heroes”‘; technically, it’s a simple song, consisting of only a few chords and a basic melody – but when layers of intricate instrumentation and its incredible passion and emotion is added, the song becomes among the most moving and poignant ever written. It was four songs that drew me to Bowie’s work; ‘Space Oddity’, ‘Life on Mars?’, ‘Starman’ and (the aforementioned) ‘”Heroes”‘. Though, in hindsight, all of these songs are actually quite bleak, there is a beauty to them that makes them so irresistible. They are filled with a catchy, passionate ecstasy that forces you – the listener – to smile and laugh and sing along at the top of your lungs, yet are filled with an intense emotion that has the ability to draw you to tears. They are filled with an infectious, affecting excitement that draws you in and rarely lets go. It’s magical. This ‘magic’ is found throughout most of Bowie’s work, and this was something I quickly discovered as I devoured his albums and songs. ‘The Width of a Circle’ is hypnotic in its heaviness and relent; ‘Oh! You Pretty Things’ is catchy and fun on first inspection, yet darkly thought-provoking on second; ‘Suffragette City’ is edgy and thrilling, enough to make you want to dye your hair Ziggy-red and invest in a sparkly jumpsuit; ‘Rock’N’Roll Suicide’ is overflowing with emotion and sadness, yet its inclusiveness (“You’re not alone!”; “Gimme your hands!”) makes you feel as if you are a member of the coolest club in the universe; ‘Lady Grinning Soul’ is lush and theatrical, yet always glamorous – never camp; even his cover of The Stones’ ‘Let’s Spend The Night Together’ is filled with a tightly-wound fieriness, making it as good as the original. Once I’d listened to his early albums, I progressed to his later work, which was easily as affecting and overwhelming as its predecessors. The tense, apocalyptic build up of Diamond Dogs medley ‘Sweet Thing/Candidate/Sweet Thing (reprise)’ is spine-chilling in its menacing impressiveness; ‘Fame’ is irresistibly funky, making it impossible to keep your feet still (plus, John Lennon! 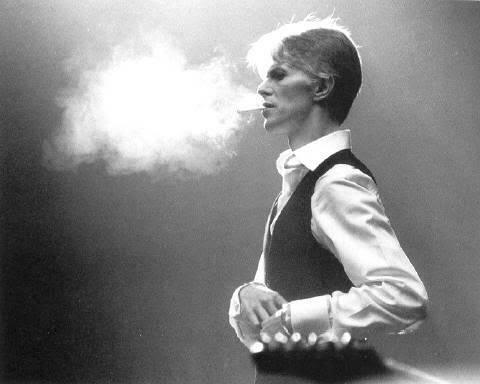 ); ‘Station to Station’ is freaky and erratic, its next move unpredictable, exploring countless styles within its 10 minutes; tracks like ‘Sound and Vision’ and ‘Ashes to Ashes’ are spellbinding in their synthy beauty, distracting you from their bleakness; and his latest work – The Next Day and the Blackstar singles – is still experimental, well-crafted and fresh, easily a match for the current music it is now compared against. Bowie’s music is undeniably amazing – still as innovative, irresistible and weird as when it was first released. He sings and plays with incredible passion and emotion, making it feel more meaningful, beautiful and real than it could’ve been without – because in the end, it is passion that makes great rock’n’roll; it’s arty and intellectual, yet not painfully pretentious; it’s thrilling, fascinating, radical and stunning; it’s art. It is great enough that it still sends shivers down my spine, even after dozens of listens. The greatness of his music has affected so many people so much. And that is a beyond-incredible legacy to own. 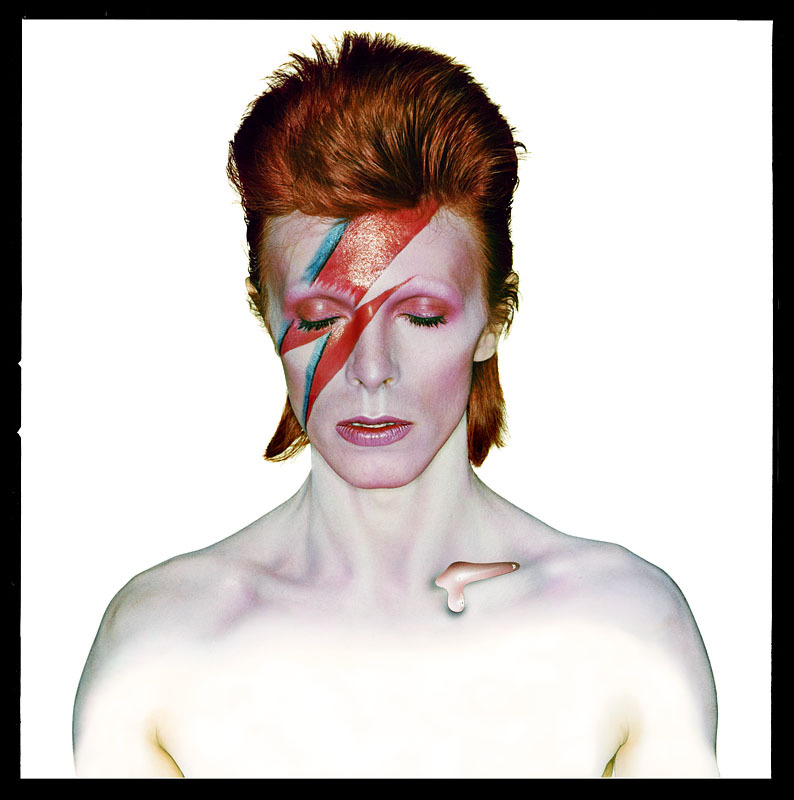 Nice post – I just had Aladdin Sane on yesterday! Thanks! 🙂 And ‘Aladdin Sane’ is such a great album, isn’t it? Great blog! 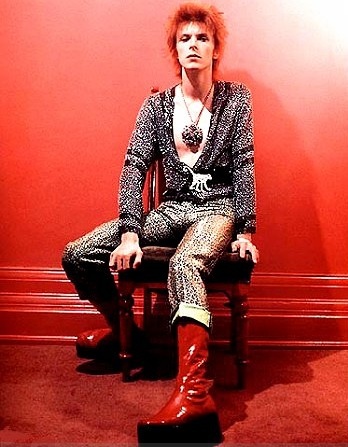 Bowie unquestionably one of the greatest musical artists of all time. Thanks! 🙂 Bowie is definitely among the greatest artists of all time – his work is amazing! This such a great tribute to Bowie! He is so complex, multi-talented, unpredictable and original. There are few artists brave enough to explore something completely unique and ground-breaking and then abandon the act (not matter how successful it was) to go explore something completely new. Your blog post has inspired me to wear my Aladdin Sane earrings tomorrow (they are literally earrings of David Bowie’s face on the Aladdin Sane album cover). Timely that you did this write-up 10 days before his death, which surprised everyone. David Bowie RIP! Wow I was just going to do a David Bowie post of my own when I saw that you had posted this extremely thoughtful and extensive tribute to him a week before he died. Eery timing that you thought to do this post when you did. His unexpected death, combined with his album Blackstar and his haunting last video for “Lazarus,” truly epitomizes the life of a groundbreaking, ever-innovative artist like David Bowie. May he rest as a Starman waiting in the sky. Thank you! I’d been working on this post for months (ever since I’d first seen the David Bowie Is exhibition), and I find it incredibly eerie that I finished it a week before he died. ‘Blackstar’ and ‘Lazarus’ now both making haunting sense, and I feel that listening to his latest album (when I finally get it!) will be a bittersweet experience – but I’m glad that his swansong was such a beautiful work of art. He truly was an amazing soul, and he will be dearly missed – but never forgotten. May he rest as a Starman, indeed!